The brothers Benjamin Marcus and Levie Marcus and their sister Eva Levie, all from Ruinen, were three of the four children of Marcus Levie Levie and Clara Stern. When the children had decided to go and live in Meppel, father and mother also moved to Meppel. Marcus died on the 25th of September 1932, his wife died at the beginning of the Second World War on the 4th of January 1941. Levie was born on the 2nd of April 1886 and was the elder of the two sons living in Meppel. He married Hulda van Berg in Winsum on the 19th of August 1919. Hulda, born on the 12th of September 1889, was one of six children of Frederica Frank and Heiman van Berg. The couple had one daughter: Clara Frederica. Levie, his wife and daughter lived on the corner of Wilhelminastraat and Heerengracht, at 33 Heerengracht. Together with his brother he had a textile business on Woldstraat. More about the business can be found in the account of his brother and his family, the Levie family, 48 Woldstraat. In September 1942 an inventory was made by the Meppel police of the furniture and other goods of the Levie family and everything was then confiscated by the German army. The Levie family had one daughter, Clara. 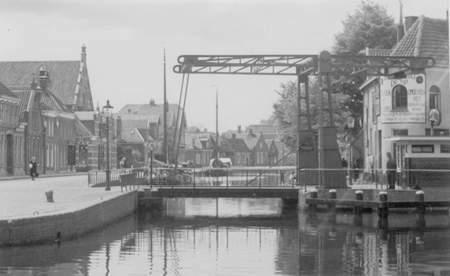 When the War began, she had already left Meppel; she studied in Amsterdam and also went into hiding there. After the War, she went to America and there she married a lawyer. The Levie family was well to do; Mrs. Levie regularly bought her clothes in the well-known clothes shop Hirsch in Amsterdam. My sister worked for Mrs. Levie as a domestic help a few mornings a week. One day, later in the war, Mr. Levie came to our house and said: ‘If something happens to us, I will bring you a few reels of yarn and a carpet from the hall.’ Then we said to him: ‘When you come back, you can come and pick it up again.’ Unfortunately, that never happened. Also, before Levie was taken away, he took a suitcase with silverware to a farmer friend. After the Levie family had been picked up, the house was sealed. Successively, the Germans took everything. I still remember that they had a couple of beautiful arm chairs. Of course these were also taken from the house. Later I saw them in the garden of the vicarage, at the corner of Zuideinde and Stationweg. What could one do about it? I knew the Levie family well, because they came from Ruinen. Their daughter Clara and I were at the Zuiderschool together, preparing for the Rijks HBS (state secondary school). After school we would walk together to Clara’s house on the corner of Heerengracht and Wilhelminastraat. There I would drink a glass of lemonade before I had to catch the bus back to Ruinen. There was always a warm atmosphere in their house; maybe it was partly because of the beautiful glass I drank from. After the War, Clara once came to our shop in Ruinen. Unfortunately, I was not there. She did not want to leave her address behind and left by sending her regards to me and saying that she was going to America to start a new life. At the end of July 1942, Levie was called to the camp in Orvelte to do some digging. He did this until the 2nd of October of that year. Then he was transported together with the other inhabitants to Westerbork. There he saw his wife Hulda again, who was taken from her bed on the 3rd of October 1942 and was taken to Westerbork. They only spent two days in the camp. On the 5th of October their train left from Hooghalen towards Auschwitz, where they both died on the 8th of October 1942. (in the photo it is approximately behind the lamp post on the left).